I just finished up reading Jonathan Haidt’s book, The Happiness Hypothesis. It’s a fantastic read if you’re into learning how to live well as a human. Like I am. Haidt uses a neat metaphor to represent the human mind: an elephant and a rider. The rider is your reason, ego, human mind and the elephant is your passion, id, animal side. The elephant runs the show more than you realize. Your human mind has about as much control over your passions as you would have control over an elephant. He goes on to say that real change comes from “training your elephant” in productive behaviors that bring happiness. Simply yelling at the elephant from your rider doesn’t cut it. There are a ton of examples of the rider failing: diets that last a week and a half, that novel you want to write but never started, even going out to start your own business. 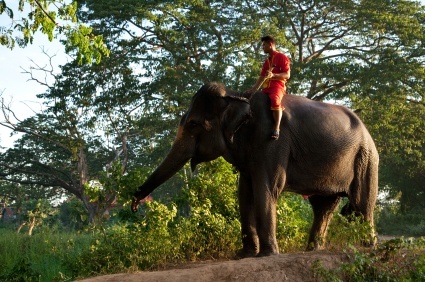 Unless your elephant is spurred into action, your rider won’t (can’t) do anything about it. This applies to the business world too. People do business with people they like, even when it doesn’t make the best rational sense. Being nice, responsive, and interested goes a long way. The best salespeople are genial for just this reason. And emotive marketing works the same way. I can list the features of my product until I’m blue in the face. But if you don’t feel a need in your gut that you want it, I’ll never be able to get your rider to move your elephant. So start appealing to your customers’ elephants!